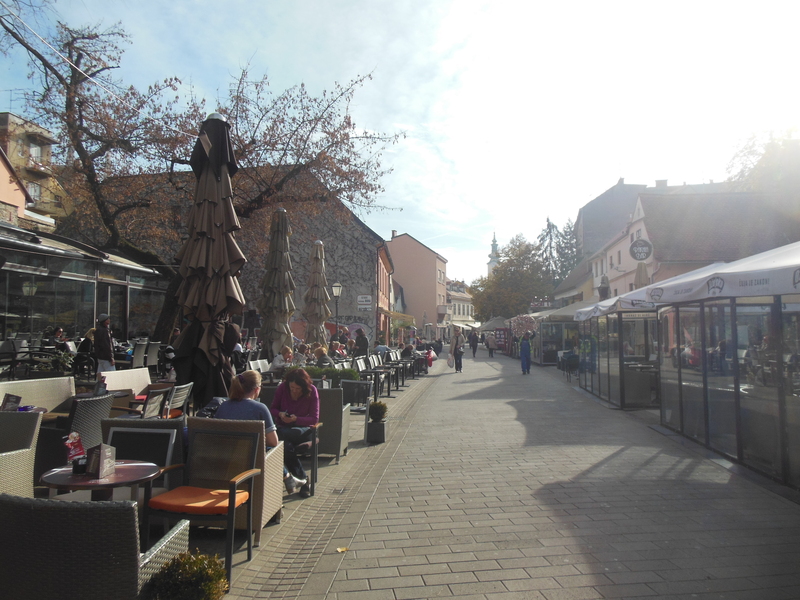 Here’s a summary of our day in Zabreb so far: coffee, burek, market, walking, coffee, pizza, sculptures, sauerkraut, gay bar, walking, burek, sculptures, OH GOD LOOK AT ALL THOSE PEOPLE DRINKING COFFEE! DO THEY EVER STOP DRINKING COFFEE?, walking, sauerkraut. 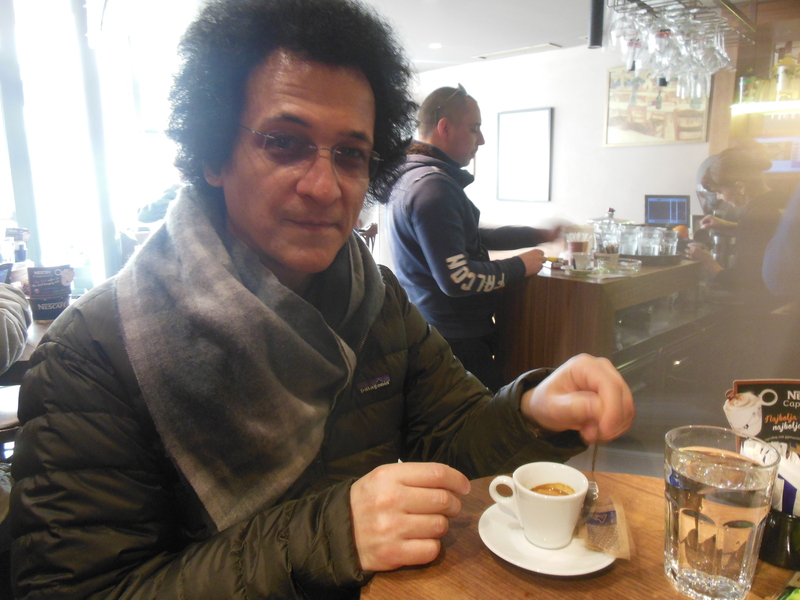 The espresso is really stinking good. 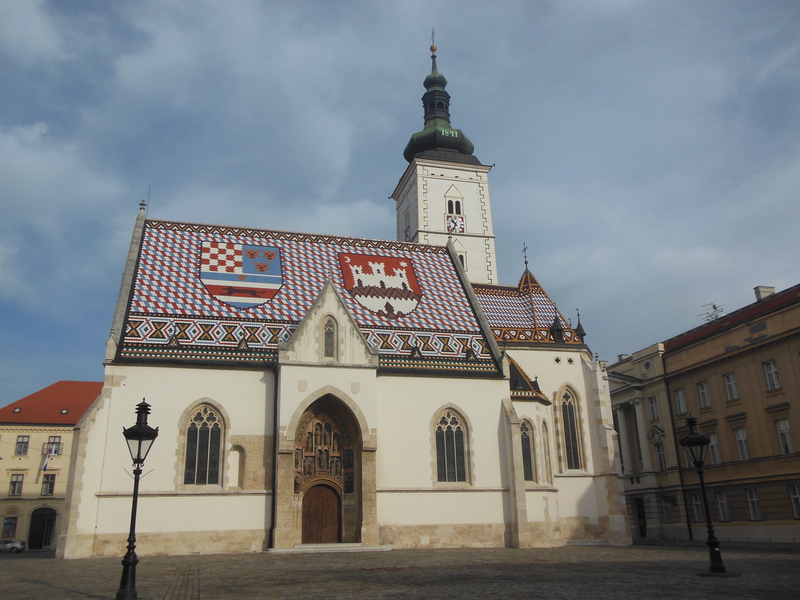 And the best part–you know how to say espresso in Croatian? Espresso. Done. So basically people hang out and drink coffee outside all day here. It’s November and a weekday and people are outside drinking coffee. Everywhere. All day. When do these people work? How can I get in on this lifestyle? A sign of a truly great town is a funicular. 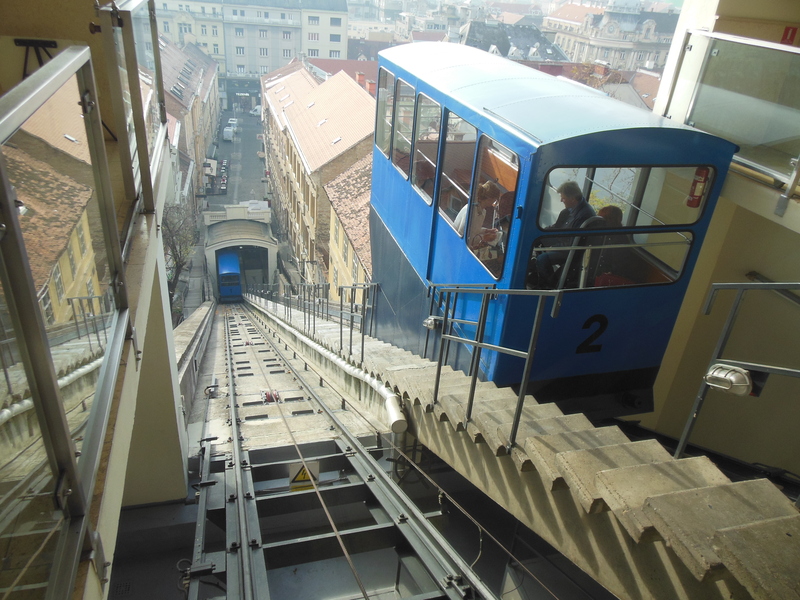 Check out Zagreb’s completely adorable (55 second ride) funicular. Take a funicular to get a great view. Another indicator of a superior city? An excellent market. 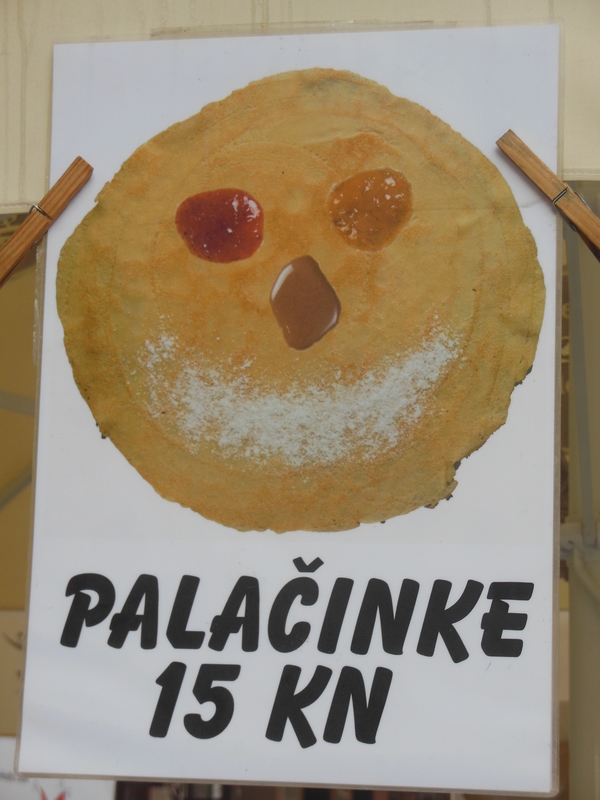 Dolac–Zagreb’s first rate market–was full of tempting edibles. 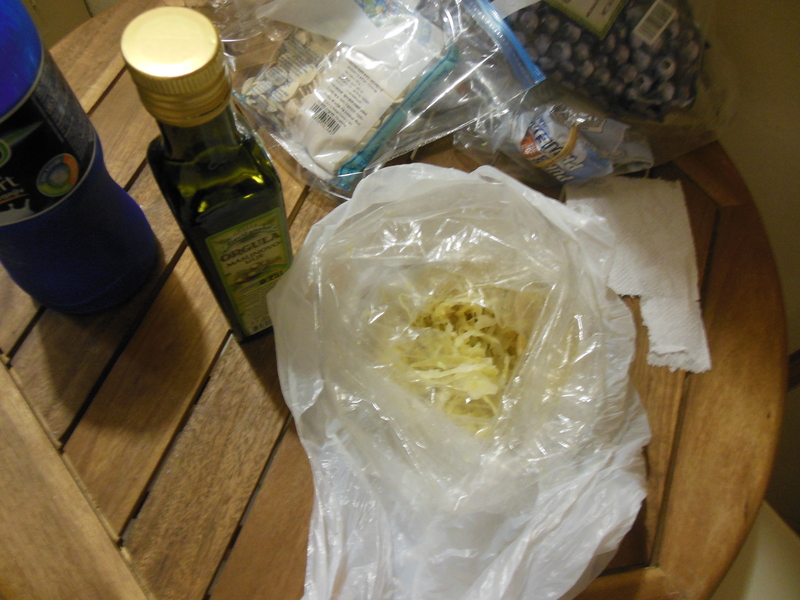 We bought a sack of sauerkraut from a granny at the market and ate it all afternoon (straight of the bag, with a fork). We smell bad and that’s okay with us. 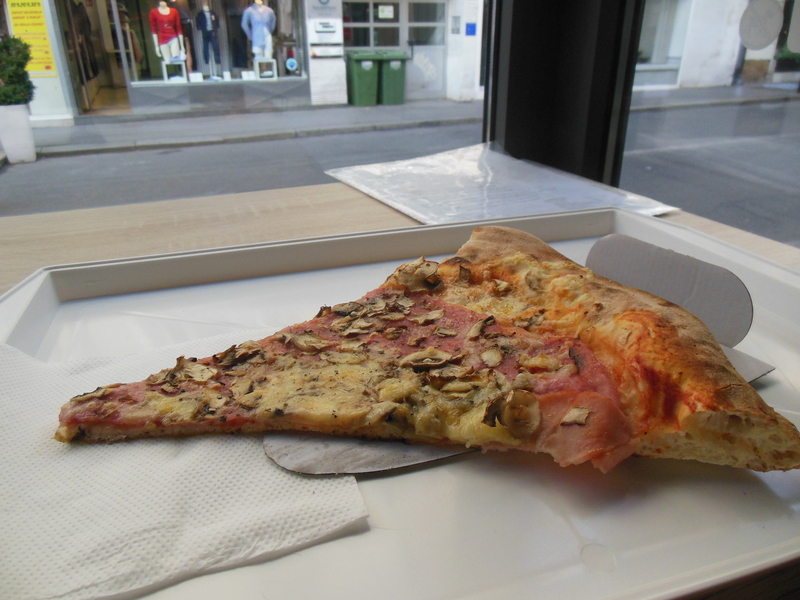 Pizza and burek shops are everywhere and the food seems to come out fresh 24 -7. We just keep eating. In between snack and coffee, we actually saw a few sights, like the stately Church of St. Mark. 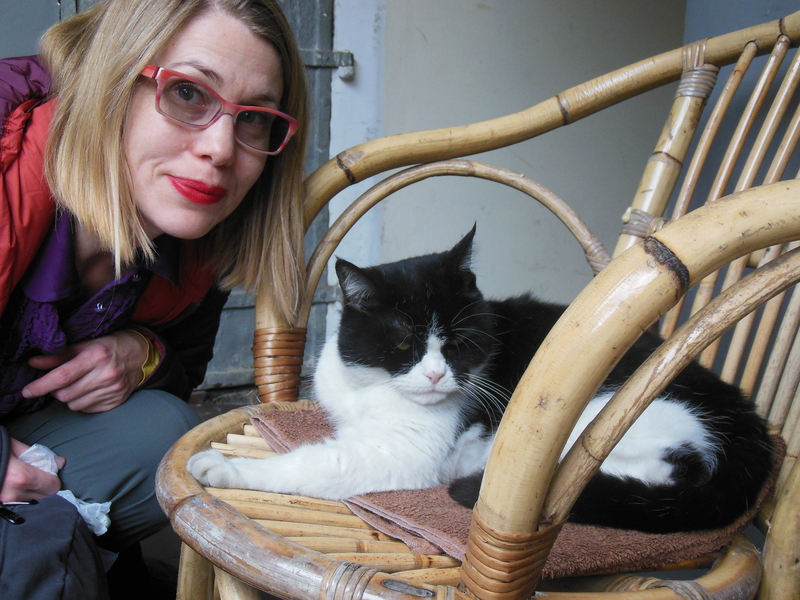 This kitty came with our room. 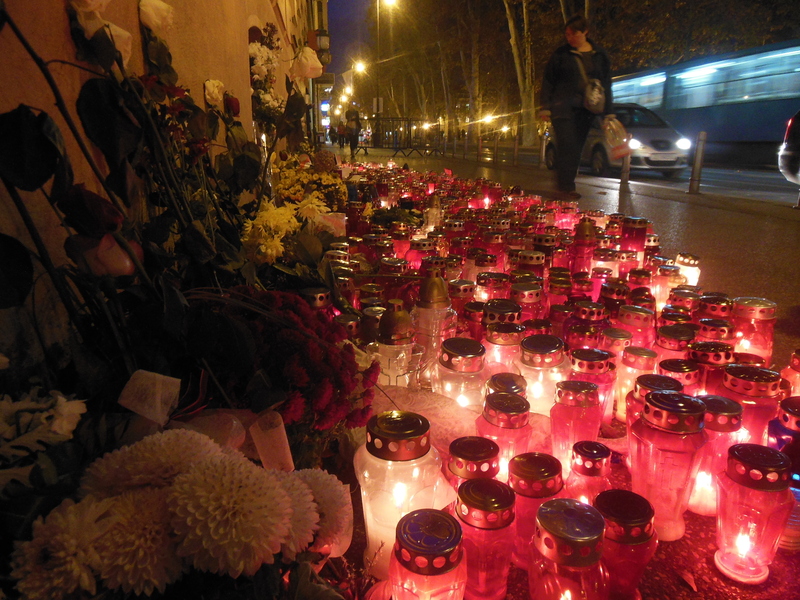 On a more somber note, there’s a touching memorial to Parisian terrorism victims in front of the French embassy. LGBT friendly (and disco-hip) bar called Kolaž. I’m sorry to leave you Zagreb. Save me a slice and an espresso with a view for next time. How we got to Zagreb: flight from Chicago. Where we slept: Guesthouse Lessi. Price: €22.50 for a double. Recommended: yes. Sitting around drinking coffee all day? Must work for the European Union! 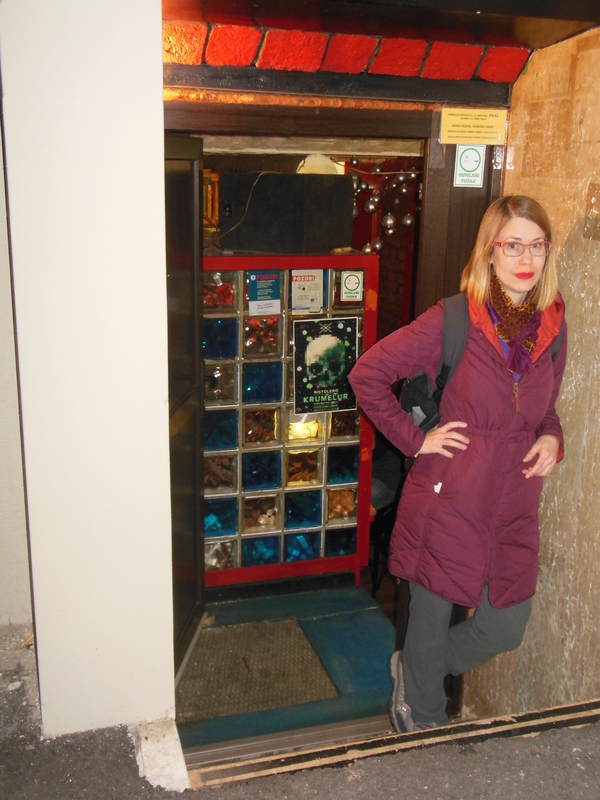 I did like that funicular….and the sauerkraut in a bag…. We had some conversations with locals on this trip, and well, let’s just say there’s some ambivalence with the EU. I love your blog! The format is quite nice. 🙂 Can’t wait to read about more of your adventures! Thank you — I can see from your blog that you’ve recently traveled in Croatia as well. What a lovely country with outstanding geography! Are you bringing the kitty home? Nah–don’t want to make Janacek jealous! It was a lovely place to live. Even during the war. You make me miss it. What an intense experience it must have been during the war, esp. since you mentioned living outside of Sarajevo. So many heartbreaking stories! My favourite memory of Zagreb was the museum of broken relationships, full of lots of sad stories of failed romances and all the little reminders that people keep from it. We didn’t get a chance to go the Museum of Broken Relationships–next time I guess. Exactly what I kept saying–my jaw looked like a Pez dispenser…. Great post. 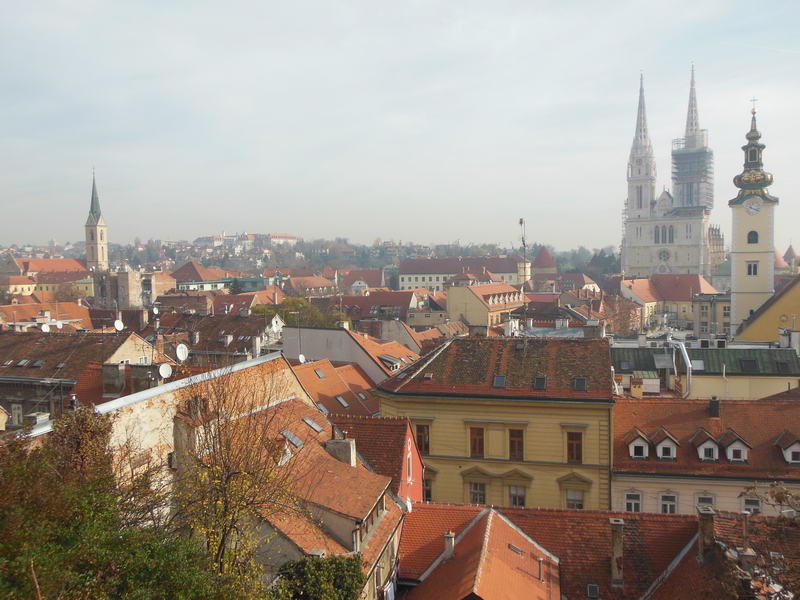 I remember Zagreb as a chilled out city which you can reach by train from Venice. Oh man that must be such a romantic train ride!